We’re losing good teachers every day. Crowd control is not only for sporting events, concerts, and angry protestors. It’s now required every single second of the day in some of our public school classrooms. I teach in Las Vegas, where class sizes are the largest in the nation. Just last year, I stood frozen in the middle of my classroom. It was filled to capacity with five-year-olds, including seven with IEPs and behavioral issues. Students were dumping crayons, throwing books, and crawling under the tables. I felt like a first-year teacher again, white-knuckling it until the dismissal bell and praying I wouldn’t scream, “Will you ALL please shut up and go home?” I had lost all control. This scenario isn’t rare or unique. All over the country, teachers are hanging up their whistles, renting U-Hauls, and leaving the public school classrooms they once loved being in. What happened to reasonable class sizes? I started my teaching career at an at-risk school in the mid-1990s, on the heels of class-size reform. My room had 17 third graders, and it was a great learning environment. What a wonderful way to feel! Fast forward to 2018. My friend Nicole Gonzalez is in a middle school math class with 40 students packed together in an 800-square-foot room, tight as sardines in a can. It’s true. The more students in one room, the louder, smellier, and more distracting it becomes. Individual teacher-student interactions and meeting student needs are impossible. Don’t pay attention to the data—it’s misleading. According to the National Center for Education Statistics, the average number of students enrolled per teacher in the U.S. has only grown from 15.41 percent to 15.96 percent in the last 10 years. This is a highly misleading number because it’s based on overall enrollment per teacher. So it’s using other staff positions to figure the average. In other words, it’s not based on actual bodies in the instructional classroom. Maybe it’s nice to count those other teachers, admin, staff, and aides for statistical purposes, but that doesn’t help the teachers struggling every day. The NEA website states that the difference between student-teacher ratio and average class size is approximately nine to 10 students. It can be higher in secondary schools because most states have no size requirements and class sizes can reach well into the 40s. The chart below illustrates the significant student growth in the states with the highest pupil-teacher ratios, adjusted for average class size. In one of the most credible studies of class reduction size ever completed in the 1980s, researchers compared Student Teacher Achievement Ratio (STAR) testing results between class sizes of 15 and class sizes of 22. They found that students in the smaller class were three months ahead of the students in the larger class. How well does this bode for student achievement in 2018? We don’t need to read statistics to tell us the answer. 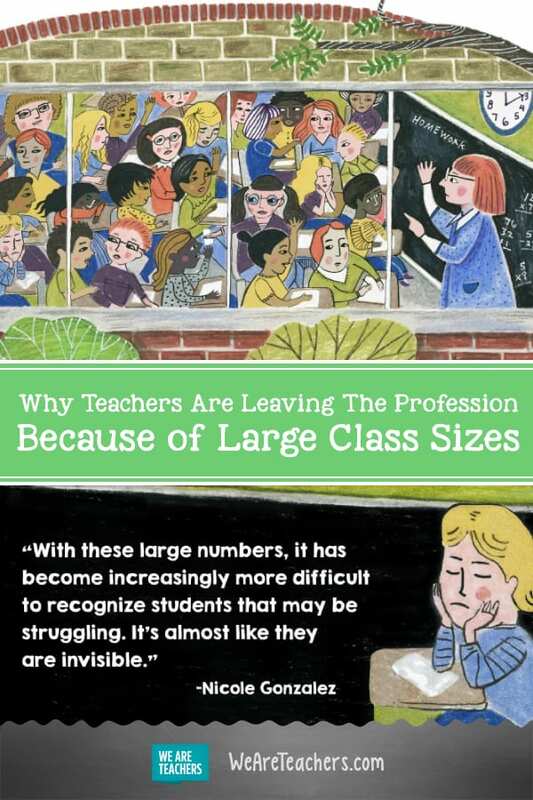 As teachers, we all know that smaller class sizes are more beneficial to students and allow us to be better educators. Teachers have had enough. Mariana Anaya is a fourth grade teacher I know in the Vegas area. She was teaching 45 students, eight with IEPs until, after just three months in the classroom, she left. Class size was also one of the main reasons the 18 Oklahoma teachers quit their jobs. This was documented in the viral Vice video, which captured the raw emotion and guilt each teacher felt regarding their decision. Changing careers is definitely something many teachers are considering, but it’s not their only option. Educators in public schools are moving to private and charter schools, where student-teacher ratios are 12:3. Who wouldn’t want to have fewer papers to grade, fewer behavior problems, or fewer outlandish parent requests to accommodate? This is what swayed my friend Jillian Guerrette, who had class sizes in the mid-40s while teaching social studies at a public high school. She compared student behavior to the game Whac-A-Mole, because when one student would start to focus, another would get off task. Jillian contemplated quitting. Then she found out that a charter school in the area guaranteed smaller class sizes. She now teaches classes that are as small as 15 students and takes great delight in the personal relationships and academic progress she is able to foster. This should be disappointing for anyone who believes in public education. We are already losing our students to the privatization of education. We cannot afford to lose our teachers, too. Stuffing 45 kids in a portable classroom that only has the capacity for 32 students isn’t the only injustice happening. In my opinion, ignoring teachers’ voices is the biggest crime of all. I think all educators would agree that we don’t give a flying flip that some studies by noneducators have found that lowering class sizes isn’t cost effective. We know firsthand that teacher and student morale, along with academic and social development, suffer with larger class sizes. We also know that smaller class sizes would help restore the joy of teaching and retain quality educators. Routinely, state legislators who vote on education funding choose to ignore the voices of teaching professionals. So what’s next? I think it’s time we take action, raise our voices, and walk hand in hand with parents and community members to our legislatures and other governing bodies. We can not and will not be crowded out of our own classrooms. What are your thoughts on large class sizes? Come and share in our WeAreTeachers HELPLINE group on Facebook.